Productive, stimulating, disturbing is how I would describe the whole week. Productive because I had the first work of the semester completed. The pig on the plate ties up lot of threads in my current practice. 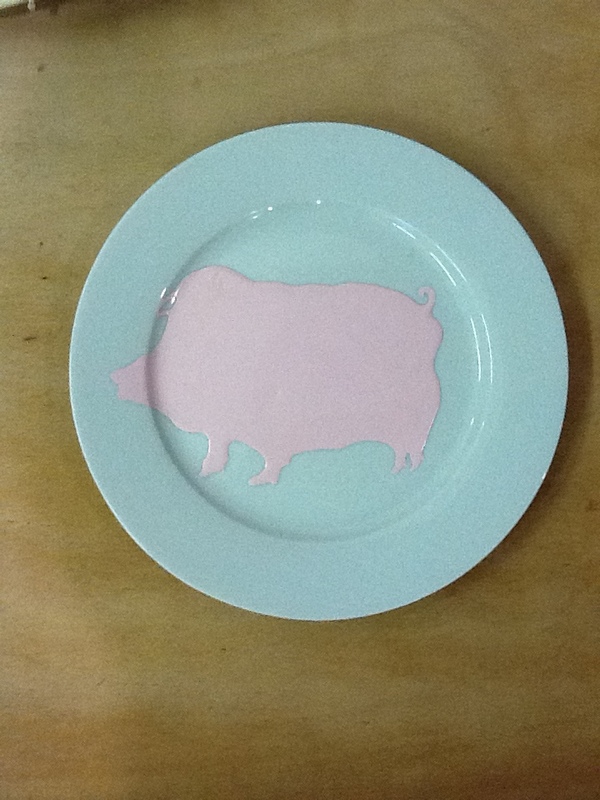 The choice of the image of pig comes from “You are what you eat”- interest in word play carrying from last semester. It also connects to the consumerist culture concept that I want to start working on. Pig as a symbol for gluttony makes a perfect metaphor for the excess driven consumption habits. The plate seems befitting also as it also denotes consuming. The first drawing is in minimal, emulsion paint, only silhouette style. I want to make another pig with more realistic and detailed image and compare the two. The seminar this week was great. I played the role of Andrew Hunt. His text was very stimulating and educational. I am learning about minor curating and its significance. I discussed his venture of Focal Point Gallery which is about moving away from the center as hub of art and culture and developing far off areas. I have a feeling I will be revisiting this text again and again. The CO2 this week was incredibly disturbing, haunting and most powerful performance I have ever seen. Anna Gibson, level 2 student drew on the walls with real menstrual blood. It was nauseating and repelling and forced me to leave the room after first five minutes. But I couldn’t wait to go back for more. What dark side in me was provoked to want more of something like that? Was this performance extremely brave and genius or merely sensational and devoid of any real content? It is easy to affect the audience by something so provoking, the question is was it the easy way out or a true artist who knows no boundaries when it comes to her convictions? These thoughts shall plague me for a while.